One of the things that has done more to enhance the enjoyment of my vintage radios is the ability to program my own radio station to feed my favorite music and Old Time Radio Shows to them. Actually I’ve been fooling around with low power transmitters since I was a kid. It all started with a Tiny Tim AM transmitter. This looked like a toy walkie-talkie but was actually designed for one-way broadcasting to any AM radio. After the initial fun wore off I removed its built-in crystal microphone and replaced it with a connecting wire for a direct input to be fed from our Webcor phonograph using a dropping resistor I selected through trial and error. I knew nothing of pads, proper loading or impedance but it didn’t matter…with this arrangement I could listen to my records anywhere in the house and even out in the yard. Of course the range was very limited and the audio quality was miserable – notably inferior to real broadcast stations. Still this was one of the most exciting toys I had and it was a thrill to be “on the air” with my own station. As it happened my Uncle had an electronics background and when he saw my setup he said, “We can do a lot better than that!” In actuality, he had previously bread-boarded an AM transmitter for his own sons, but they were never bitten by the bug, so they gladly turned it over to me. It was about a one foot square peg board with three tubes, a big variable capacitor, a transformer and spring clips for audio input, antenna and ground. All the wiring and connections were completely exposed so he gave me a quick safety tutorial. “Don’t ever touch the live wires,” and he also explained that I should never be grounded when I was using it…that is, don’t use it outdoors or in the cellar. It boggles the mind that never once did I get shocked by that rig…but can you imagine that today? Lawsuits would be flying everywhere. Well my uncle’s home brew transmitter was a revelation. Almost certainly illegal, I had no idea what its power output was (it could have been a watt or so), but with the array of wires and aluminum poles I strung up on the roof I was able to hear it for several blocks with ease. For my 13th birthday I received a Lafayette RK-142 mono reel-to-reel tape recorder. Now I was able to produce programs for my station then listen to them while I rode my bike around the neighborhood, transistor radio precariously taped to the handlebars. My friends would bring their records to the house and we would play all the top hits. We were having a great time! That transmitter was not, however, without its problems. For one thing, it had a nasty hum. For another it was evidently rich with harmonics, as I later learned that my transmissions were interfering with my neighbor’s police monitoring hobby. At age 15 I received a telegram from the FCC office in Boston, requiring me to cease and desist immediately! I never understood why the neighbor didn’t let me know I was causing him grief but that was neither here nor there…it was the end of my mini broadcast station for a long time. The transmitter did have a second lease on life though when I attended college. Broadcasting from the 18th floor of my high rise dormitory, with a wire antenna hanging down to about the 3rd story level, the station covered most of the campus. I eventually handed that transmitter over to someone else to operate, as my activities were in conflict with my involvement with the campus student radio station. Unfortunately I never reclaimed the transmitter at the end of the school year and that’s the last I heard of it. It wasn’t until years later that I again became interested in mini broadcasting. Having started collecting radios and also having an interest in Old Time Radio shows I started experimenting with every mini AM or FM transmitter I came across; from a Radio Shack wireless lapel mic to toy broadcasters. All were fun but none were satisfactory for real listening, suffering from miscellaneous noises such as whine and hum, miserable audio quality and limited range. They were, after all, toys, and that’s just how they performed. I heard through some internet discussion groups of a new company called SSTran. Their website proclaimed that their new AMT3000 series AM transmitter were high fidelity with wide, flat frequency response, low distortion, and flexible grounding options to eliminate hum. 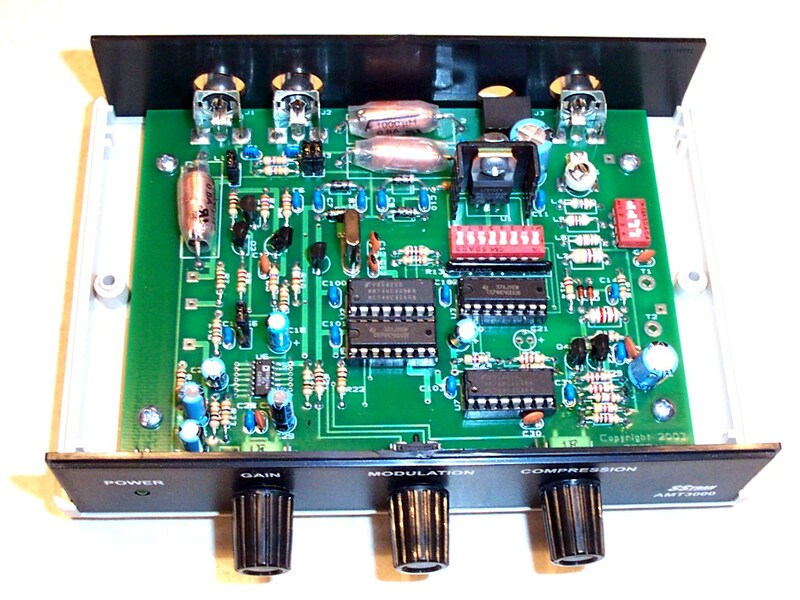 I bought one and spent the weekend assembling it and I’ve got to say that this is without a doubt the finest home AM transmitter I’ve ever seen. Part 15 compliant it is completely legal as long as it is used with the supplied wire antenna. In that mode it will cover your home with a strong signal that will extend well out into the yard as well. You can also buy or build a base loaded vertical antenna which will increase the legal range up to 2 miles should you wish to do so. However for my uses feeding radio programs to my household radios the much simpler wire antenna is more than adequate. I have mine hooked up to the output of my computer’s sound card and using the free Winamp player from http://winamp.com , I can create playlists that play for days on end without repetition. SO HOW WELL DOES THE SStran WORK? Unbelievably well – and for several reasons. First, the manufacturer’s claims that this is a high fidelity unit are not exaggerations…with the proper input signal my station sounds just like the “big boys” with full modulation and strong, clear audio. There is little background noise…the configurable grounding system is partly to thank for that. In reality, the short wire antenna does impose some high frequency limitations with any AM transmitter compared with a full sized antenna but this is inherent in short wire antennas for AM and in any case, can be compensated for with a bit of judicious equalization. The AMT3000 also offers a jumper selectable high frequency boost for added clarity if desired…most present day AM stations use similar equalization and I found that my station sounds most like commercial stations with this boost activated. Transmit frequency is settable via dip switches and is crystal controlled for rock solid performance. Versions are available for 9 KHz or 10 KHz spacing. And although the unit is monophonic, for ease of hookup to a stereo sound source it has dual RCA input jacks which are internally combined to mono. Another unique and welcome feature of the AMT3000 is it’s built in audio limiter. This is a very deluxe design which, if you understand the theory, will let you not only coax maximum undistorted audio from your station (as commercial stations do), but also let you set the “sound” of your station by controlling how the program material’s dynamic range is handled. With very low levels of compression you will hear most of the volume variations in the source material which might be preferable for classical music. At the other extreme you can set it for tighter compression like most AM music and talk stations do, so every song or program will be maintained at a nearly constant volume. This kind of control is a real boon to people like me who have collected music and programs from many sources, all at different volume levels. Even my Old Time Radio shows are much easier to listen to through the SSTran than they are directly. I was always bothered by the fact that the quiet sections were hard to hear while loud portions would blast me out of the room. Now they can all be comfortably heard as they were originally broadcast and that is a major improvement not available on any other comparably priced mini AM or FM transmitter. I have collected many Old Time Radio Shows (OTR) on my computer and it is a real treat to listen to them on my vintage AM radios without being at the mercy of my local broadcasters. The kit was relatively straight forward to build. There is one surface-mount IC which contains 14 leads with .05 inch spacing. If you want, you can obtain the kit with this one part already soldered in place for an additional $3. I recommend you do so unless you are an experienced kit builder with very steady hands, good eyesight and own a quality soldering station. 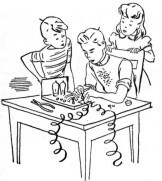 *For those who have never built a kit before (I grew up building kits from Heathkit, Dynaco and others) I have included some basic kit building tips at the end of this article. I constructed the kit over the course of a weekend and was pleased that it worked properly when I powered it up. There is even an antenna tuning circuit to get the most performance out of the wire antenna. I initially hooked it up to the output of an MP3 player and it worked fine, but subsequently found that a bit more high end boost when connected to my computer (actually in the 6K range) improved the sound clarity. If you should opt to build the sophisticated base loaded vertical antenna this high frequency limitation will not be apparent. The transmitter itself has virtually flat frequency response across the entire audible range and beyond what commercial broadcasters are allowed to transmit. On a radio with a wide band AM setting, such as the GE Superadio III the SSTran sounds like an FM station. In many ways, owning this little marvel has transformed the way I collect and listen to music and OTR. I have created playlists in my computer for every style of music I like, such as 40′s Hit Parade, Oldies by decade etc. And of course, all my OTR shows are also in the computer. I plug in the SSTran and turn on radios around the house. This is a real attention getter when friends visit. As I mentioned it puts out a strong signal throughout the house and about half a block down the street…the optional base loaded vertical (details are on the SSTran website) can legally extend coverage out to 1 – 2 miles. I have been using my AMT3000 for over two years and it is as stable and solid as a rock. I have no doubt it would operate 24/7 indefinitely. It is available for $89.95 to $92.95 from http://www.sstran.com/ . Very little technical expertise is needed to successfully build a kit such as the SSTran AM transmitter. The instructions will guide you explicitly through every step. Follow them exactly…re-read any step that isn’t absolutely clear to you. Sometimes you may need to walk away for a rest and come back to the kit later. You need patience, a steady hand, the proper tools and a good work environment to get organized and avoid mistakes. Tools: Only basic tools are needed. 1) A low wattage (30-40 watt) soldering pencil or better still, a soldering station and good quality solder rosin core solder. Never use acid core solder…it will ruin your kit. 2) Solder wick or a solder-sucker if you need to de-solder something. 4) I also like to use a magnifier lamp as my eyesight is not as sharp as it used to be. If you proceed in an organized careful manner your kit should work when you first try it. Although many kits are successfully assembled on a kitchen table it is best if you can find a quiet spot that will be undisturbed until your kit is complete. The two most common reasons kits don’t work are poor soldering technique and parts installed in the wrong spots. I know…I’ve done them both. When I was young I once built a pre-amp kit and wired the entire back panel in a mirror image of the way it should have been because I misread a pictorial and did the whole thing in reverse! I took me a long time to undo that mistake. Soldering technique is crucial but not difficult. You need to keep your iron’s tip clean with a damp sponge or cloth and occasionally tin it with a dab of solder. When you install a component on the board, bend the leads so you can push them through the PCB, then slightly spread them apart to hold the component steady. Heat the junction of the wire and the PCB trace, then let the solder flow into them until it is smooth and shiny. Do not disturb the connection until the solder hardens or you may get a cold solder joint. Then snip off the excess leads. I also recommend sorting all the various parts first. My color vision is not the best it could be so I separate all the resistors according to value…the magnifier helps see those color bands, and I double check with an ohmmeter. I sort all the other parts (capacitors, diodes etc) by value as well. You should also check for missing parts at this time. Take your time…you cannot rush a kit. Believe me; it is far better to take more time building it carefully than it is to end up with a kit that doesn’t work because you made a mistake somewhere. Should you encounter a problem you will have to check that each part is in the correct place and oriented correctly – some parts which can only be installed in one specific direction.